I showed you the fabulous striped wall feature I painted in my daughter's room. Now we are working on "fluffing" up the space. This weekend we started the gallery wall. This is where we are right now. Everything is done at a snail's pace around here as life keeps getting in the way. As does hubby's declaration that there should be a moratorium on spending. It looks beautiful. Love those stripes. I have to do a gallery wall for my son's room, as we rearranged things, in his room this past weekend. Don't you just wish that you had a whole weekend and a help crew to finish up a room? It is looking so crisp & hip! I appreciate your snail's pace - it is about the same pace as me! I'm impressed that you actually plan out the gallery wall with the templates... I always just start firing things onto the wall... hence, the seventeen thousand nail holes all over my house. Somehow I missed your post about the striped wall. It's awesome! Can't wait to see the gallery wall. I'm super impressed that you plan it! Nothing like a moratorium on spending to get those creative juices flowing! Ooooh it's going to look great! Gallery walls can be very inexpensive to do, so hopefully you can get some up within the budget. I don't know if it's fall or what, but I think everyone is hopping on the budget train! So far so good!I really like the stripes. And no budget is a great excuse to force us to be creative! Great interview with Anne Marie from 10Rooms! 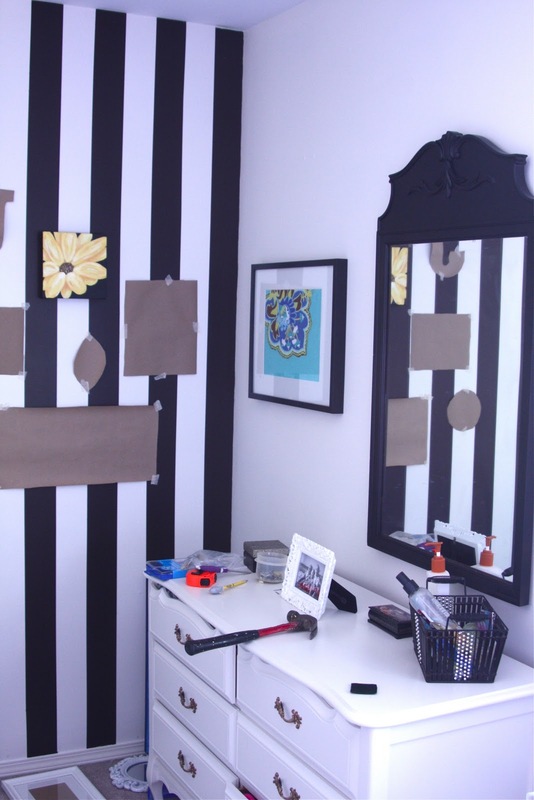 Wow your daughter is a lucky girl!...Love the inspiration & your stripes are really looking even more fab with all the decorating !..Fabulous!